A Very Special, BIG Announcement! Fascinated by Jack the Ripper? Like historical thrillers or mysteries with a message? You’re in luck! 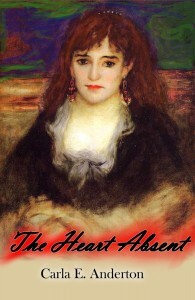 My debut novel, The Heart Absent, is now live on Amazon Kindle and Barnes & Noble Nook Book. Pick up your copy today! Don’t have a Kindle or a Nook? Never fear! The Heart Absent is also available on Kobo and will soon be available from Apple iBooks and in a print format (available from multiple sellers). Stay tuned for more details. Novel synopsis: 14-year-old James Nemo spent most of his youth motherless and under the thumb of a father who hates him. These injustices he quickly forgets, however, in the arms of a beautiful young prostitute named Nelly. Reality conspires against the young lovers, and James is left, alone and angry, to confront the truth behind his mother’s abandonment. Twenty years pass. James, now a respected artist, meets Mary Jane Kelly, an Irish prostitute who bears more than a passing resemblance to Nelly. Convinced his redemption lies in her, James slowly ensnares her into his ever darkening world. His passion for her escalates to a frenzy, amidst the backdrop of Victorian London, and threatens to consume them both. Live in or near the Pittsburgh area or just up for a road trip in general? Join me at Jozart Center for the Arts in California, PA on Saturday, May 11 at 7 p.m. to celebrate the release of “The Heart Absent.” I will give a brief reading from the novel followed by a short presentation on Jack the Ripper, one of history’s most infamous serial killers. Light refreshments will be served. For further details, visit the Facebook event page.